If you'd like to win a Mini Kersey of your own from White Faux Taxidermy, you're in luck! All you have to do is 'like' White Faux Taxidermy on Facebook! **If you'd like an additional entry or don't have a Facebook account, visit the WFT site and leave a comment here sharing your favorite! Please leave a separate comment for each entry, and please make sure there is a way to get in touch with you in case you win (email linked in your name, leave your email address, etc). The winner will be drawn on Monday, September 30th and announced shortly after. Good luck, friends! I love this small white bear had and actually have it hanging above my t.v. I love all the animals in the clean and simple white color. I liked White Faux Taxidermy on Facebook. I am LOVING the deer head with silvery glitter antlers! What a great shop. I'm in love with this pink deer! My favorite is probably the white wolf head! I'm so excited for this giveaway. The flowers look great on your bison, I would love something like that in my house. My favorite's The Compton Small Stage Deer Head. So elegant! LOVING the Lennon. A huge statement with class! I liked White Faux Taxidermy on Facebook! So cool! I love the Seafoam Green Resin Deer Head w/Silver Glitter Antlers. Love these! I am torn between the Compton in antique silver and the Eloise with silver glitter antlers. Adorable! I visited the website and loved all the different pieces. Cool idea! I love the Alfredo Moose head! But The Bartholomew shark head is amazing! Gold everything! And my favorite is the rhino! So cool! All of the hot pink heads are amazing! L O V E! Liked on Facebook, and obsessing over the antelope!! and i adore the moose...i love moose-s. meese. moose? haha. What a great giveaway! I love them all but since my college friend used to call met Hert (which is Dutch for deer), I like them the most. Especially the one with the red horns, to die for! HUGE fan of the moose. It would match so well with my boyfriend's housing group moose mascot. I Love the Ram head with gold horns also. I liked WFT on Facebook! It's all pretty cool, but I'd have to go for a classic deer head with gold glitter antlers. He's so handsome! Also, I love the Amalia! The Seafoam Green Deer is a favorite. All of them are super rad though! The Amalia Deer Head is pretty awesome too! My favourite is the wolf! Although I can't decided between the gold or the white. love the alfred with gold antlers! That hot pink rhino is calling my name!!! i LOVE the bison in the photo here. the antique white resin with gold glitter horns! I love the Melby as well. I would probably paint the horns an aqua color. I liked their facebook. I love these! That turquoise moose head is amazing! I am vegan, and this would be the most perfect for me :) I may have to buy it if I don't win! and my favorite is the amalla! I'm in love with the sea foam green deer with glitter antlers. Hubba hubba. I like the Agnes Stag in seafoam green with silver glitter antlers. I'd never heard of this company before but I definitely went ahead and like them on Facebook now. Too cute! I love the elephant!!! I want Madeleine in my living room! I love the Kersey bison head with gold horns pictured here, but also the Winston stag head with gold antlers. The white on gold is so great, it would be hard to choose! I love their mini bear head in seafoam resin. I'm thrilled to learn about this sight because I have been wanting some faux taxidermy for a while! I love the white shark! We have the amalia and love it but my new fav is the elephant mint green. My favorite is the Bison head! Like on FB. Cool beans! totally liked them on fb! i am in LOVE with the white elephant head with silver tusks! love, love, love! thanks for the awesome giveaway btw! My favorite is the Amalia. I liked White Faux Taxidermy on FB. My favourites are the Bear, Bison and TRex! I love this brand! I liked it on Facebook just now. My fave is the The Edmonton Moose Head Faux Taxidermy White Resin. 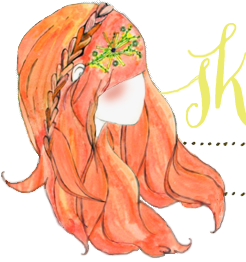 I have one faux head already and I would love to add another one to my collection! I also really love The Sanford Mini Elephant Head Faux Taxidermy in Chrome Resin. Oh fantastic! I like them on Facebook! My favorite is definitely the Eloise with Gold Antlers! So pretty! i was just talking about these with a friend i love them all!!!! Liked! These are so gosh darn lovely! So hard to choose but if my arm is being twisted, then probably the Layla? Ugh, I want them all, though! I liked WFT on Facebook as well, as "Erin Rachelle Kelly." Thanks for hosting this giveaway, Katie! I'm totally into it. wow, awesome giveaway! I liked their FB page. I LOVE their bison skull heads! Those are so cool and would look perfect in my house! Liked on Facebook! Great stuff! i liked them on facebook! i adore the glitter details. I am in LOVE with the mini Tiger head! :) And absolutely love this idea - I'm uncomfortable with having a real animal head in my house, so I love that I can have the idea without the "gross" factor, haha. Oh man these are fantastic! I love The Lincoln! I liked their FB page! I think the Kersey is my fave! Love the curly bison hair. It would look great in my urban cabin den! I like the turquoise stag deer head. What a vibrant color! I love The Compton Small Stag Deer in gold. These are so great! The Eloise small stag deer head is the most adorable. and I absolutely love the t rx head in gold! Love the The MINI Winston - White Resin w/Gold Glitter Antlers! liked on fb, and i love the alberta bronze bear! woot! Also after visiting their site, have my eye on the Owen and the Winston! pick me! me want buffalo head! ME NEED BUFFALO! So cute! I loved the backboard you did for your Kersey taxidermy! I've had some of these as favorites on Etsy forever. I love The Lydia- White W/ Bronze Metallic Antlers. My favorite is definitely the white elephant :) But I also love all the ones with glitter horns! I liked WTF of fb! 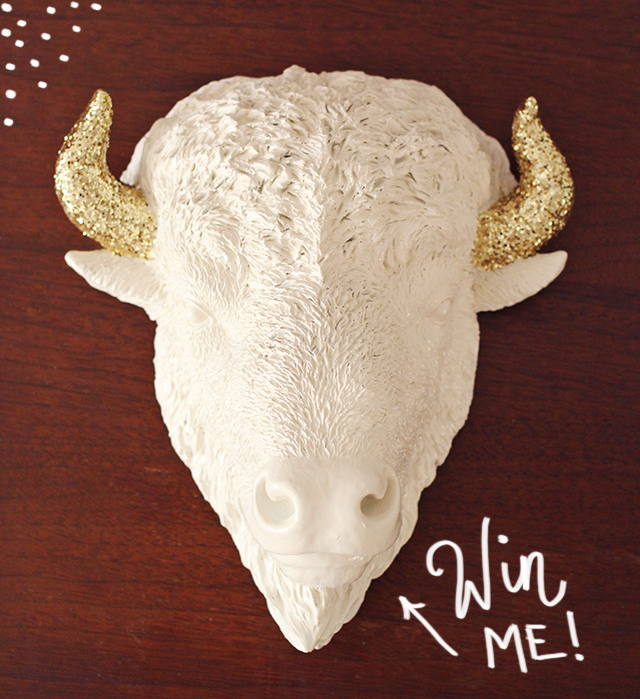 My favorite is The Kersey | Bison Head | Faux Taxidermy | Antique White Resin w/ Gold Glitter Horns! I've been wanting the deer with glitter antlers for quite sometime now! Love it! Awesome sauce. Liked on Facebook. and my favourite is definitely the gold shark! Liked on FaceBook! So Cute! Liked on FB! I NEED this in my life. Oh my gosh. The all gold large wolf!! Love. Love. Love. I cannot stop giggling over the squirrel mounted over the dachshund's food + water bowls! Pawsibly the most darling thing everrr! The Weston is so great, and I would love to have him mounted in my room. He would fit in so nicely with Sheldon, my bear ottoman. turner (dot) annamarie (at) gmail (dot) com. Thanks! So fun... I liked WFT on FB! That chrome shark head- The Leonore, he's cool! I liked WTF on Facebook! I NEED the gold T-Rex!! For sure my #1 favorite! Wow, these heads are gorgeous.. I love the Mini Elephant in mint green!!! I liked them on Facebook. They have such great products! Bonus entry: I love the Ludmilla! Also, that zebra is so amazing! Amazing! I love, love, love the gold zebra! oh yeah i facebook liked wft! my favorite? the bartholomew shark head. cue the jaws theme song now. My favorite is the eloise with gold glitter antlers! So pretty, and makes quite a statement! I love the Eloise with gold glitter antlers. So pretty and fabulous! A stag with glittery antlers! Or a gold bear, cant decide! My favorite is the Winston! I liked them on Facebook! I have been looking at their stuff for ages! My favourite is the White Resin Deer Head w/Silver Glitter Antlers! Wonderful! What's Your High and Low of the Day?